We had been in Scottsdale for two weeks checking on the house, visiting my sister and doing a few things for our daughter. Since our son was flying from Vermont to Albuquerque, New Mexico on December 22 for Christmas, we had to return to our home in Bernalillo, New Mexico by that evening so we could pick him up at the airport. With much winter driving experience in the mountainous west and southwest, I had become accustomed to the vagaries of winter weather in this part of the country, where rain can unexpectedly become snow as altitude increases and snow intensity and accumulation can vary dramatically with altitude. So I knew what risks I was taking by traveling during December, typically the worst winter weather month in the southwest. But I never anticipated the risk and danger of what challenged my driving skills later that day and night. As we left Phoenix at around 11:00 AM I remembered the weather forecasts I had read early that morning on the internet: In Heber, Arizona, on the downhill side of the Mogollon Rim, “snow flurries beginning in mid afternoon, becoming heavy snow later in the afternoon:; in Gallup, New Mexico, the highest and coldest part of our journey on I-40, “snow beginning late in the afternoon”. Naturally I hoped and anticipated that we would be through most of the journey across the Arizona high country before the snow presented a serious problem. And it appeared that we would avoid the worst on our way to Albuquerque, arriving in late afternoon or early evening. This is not how we found the conditions we encountered on this four hundred mile trip, which normally takes a little over six hours, taking us from Scottsdale on state highway 87 up the mountains into Payson, then highway 260 over the Mogollon Rim to Heber, then down the mountains on 277 and 377 to Holbrook and finally Interstate 40 straight east to Gallup, Grants and Albuquerque, New Mexico. Another factor considered was that Arizona winter storms usually come from southern California, cross east over the deserts and greater Phoenix as rain and then become snow as they cross the mountains and head into New Mexico and Colorado. And a good sign on this particular morning was that Phoenix was partly sunny with no rain. So with this combination of forecast information and prior experience we hopefully and confidently began what turned out to be the most frightening and dangerous winter driving experience in my better than fifty years of driving. As we ascended the mountains toward Payson, the sky became cloudier, changing from a gray sky with some cloud definition to the dreaded monotonous and featureless all-gray sky which almost always portends snow. And indeed snow began in earnest east of Payson but the highway information sign there warned only of “winter driving conditions”, not “chains or four wheel drive recommended” or “required” as is sometimes the case, so thus encouraged, we kept going through the town of Star Valley on toward the steady and steep inclines ascending the Mogollon Rim. As we did so, the snow became significantly heavier and began accumulating, covering the road surface and showing the tracks of previous vehicles. We continued on in our little front wheel drive stick shift Corolla first alone and then coming up behind a pickup truck which seemed at first to be proceeding fairly well. But as many winter drivers will tell you, keeping up momentum while going up an incline on snowy roads is important, and the vehicle in front of us, while at first providing a sense of security since it was leading and we were following, slowed to an intolerable crawl. We finally found an area where it hopefully could be safely passed, so I did so successfully, though with both hands in a white-knuckled grip on the steering wheel. We were finally past the vehicle and moving ahead of it rapidly, but in the uncomfortable position of leading, with no one in front of us. Nevertheless, we were able to follow the still discernible but rapidly disappearing tracks of previous vehicles in the ever-increasing snow. The snow increased dangerously in depth, but still the only signs of a snowplow were several of them stationary along with some highway department pickup trucks in the median of the road before one of the steepest inclines up the Rim. Needless to say there was no sanding of the roads going on either so our main objective was to keep the car moving onward and upward, to not lose momentum or lose sight of the sides of the road. I do not recall on this part of the journey any cars or trucks off the road. In the meantime the snow was increasing but thankfully bypassing our windshield. Even with moderate heat on in the car, no snow was melting and then freezing on our windshield. Finally we got to the top of the Rim on Highway 260 and proceeded on toward Heber with the snow getting deeper. In Heber, we quickly dispensed with our plan to stop at the Chevron and Dairy Queen because of the fairly steep drive up to the station from the highway and indeed there were several cars stuck in the snow up the street near the gas station and at the bottom of the gas station drive. Finally coming to Highway 277 toward Snowflake, from which we take 377 down the mountains to Holbrook, the snow seemed to lighten up a little. As we proceeded to the 377 junction, driving became much easier and we headed downhill toward Holbrook on a much improved road surface, just snowy in spots and the snow coming down in occasional flurries. When we arrived in Holbrook and stopped at our favorite gas station (good prices and very clean restrooms) there was no snow at all, just very cold temperatures. My inquiries of a man at the pumps regarding road conditions on I-40 east were met with shrugs although he had heard of how bad the snow was between Payson and Heber. So we hit the road east on I-40 with high hopes that we had encountered the worst of it. And indeed on I-40 between Holbrook and Gallup there was no snow so we drove the customary 80 miles per hour trying to make up some of the time we had lost through the Arizona mountains where we had averaged perhaps 30 mph. And yes our spirits were buoyed by the clear highway and no sign of snow on the vehicles coming west toward us. Also, again, since storms typically move west to east, we had good reason to think we were now ahead of it. But the sky remained a sullen, threatening solid gray, again, very much the “snow sky” that we knew only too well. And sure enough, as we came into Gallup around 4:00 PM, a fine powdery snow began falling, making it appear that the other vehicles and nearby buildings were in a fog. However, we were still quite positive that we had gotten through the worst of whatever was coming and, with only 140 miles to go to Albuquerque, usually a quick two hours, that we could get home easily and by a reasonable timeHowever, this positive outlook quickly changed to grave concern as the snow continued to fall rapidly and began to accumulate, slowing our driving speed to around 50 mph. Also the wind had increased significantly and drifts began to extend onto the roadway. With no snowplows in sight and the snow getting deeper, we and the rest of the traffic, including many trucks, kept heading steadily east, but slowed to between 30 and 40 miles per hour. I began to feel very tense and stressed, since by this time the snow had increased significantly and we began to see a few vehicles that had spun off the roadway into the median and a few stranded in the growing drifts on the sides of the road. Several times I got a sickening feeling as I felt the steering slipping in the snow or the wheels spin when I accelerated slightly. In situations like this, a driver has two choices, neither very good: To keep both hands on the wheel and keep moving or take a suitable exit and get off the highway. With our requirement of getting to Albuquerque to pick up our son sometime that night, we had no choice but to take the first choice and keep going. However, in making that commitment, one mistake – accelerating too fast, using the brakes impulsively, over steering, slipping off the road and on to the shoulder on the left or right, and the car would end up stuck like the others we had seen. I couldn’t take my attention from the road or my driving for a split second for fear of making a mistake – thus the incredible stress and tension. We had listened to the radio for awhile on I-40 between Holbrook and Gallup, but now the radio and the music were silent because frankly they were potentially disastrous distractions. After what seemed like an hour of tense driving we were dismayed to see that we were only at Thoreau, a mere 25 or 30 miles east of Gallup, with a huge distance yet to go to Albuquerque. It had seemed that we should be much further east, but of course, we were used to the distance covered at more normal driving speeds. It was around Thoreau that we finally passed a semi that we had been following for some time but had slowed to a crawl. In a few minutes were came up behind a late model Honda Accord that seemed to be handling the snowy highway quite well, moving along steadily at about 30 miles per hour without hesitation, moving into the left lane to pass slower vehicles if necessary. While following the Honda over the next thirty or forty miles (distance on this night was very difficult to estimate) our little convoy, including maybe a half dozen cars behind me, was constantly threatened by eighteen wheeler trucks, who, with their greater weight, kept passing. It was horrifying to look in the mirror and see the lights of yet another semi approaching in the passing lane. Several times I thought a truck would strike our little car on the left, so close were the vehicles and so dubious was anyone’s view of the highway lanes. Up one long incline, where the snow was getting quite deep, our Honda led us into the snowy passing lane to get around a semi that had jackknifed in the right lane and shoulder, the trailer sort of in the right lane and shoulder, headed east, with the tractor at right angles to the trailer, pointed south, to the right. It seemed that the worst offenders were Fedex trucks, which always seemed to be going too fast and were too eager to pass. At about this time, we noticed many more vehicles off the road, some at crazy angles on the broad median strip, and some off the shoulder, apparently stuck in the snow. An increasing number of trucks appeared off the road as we got closer to Grants, some being assisted by tow trucks and accompanied by the crazy flashing red lights of police cars. At this time, I wondered why the highway had not been closed heading east and decided that perhaps we were just ahead of any closing and thus being allowed to try to complete the journey. I was certain that west of us, maybe just east of Gallup, I-40 must have been closed off. As we followed the Honda, a terrible thing began to happen to our windshield, which up to then had been clear. Either it was getting colder or we had too much or too little hot air on the inside of the windshield, but a problem that I had experienced on other winter trips in the past, was occurring again. Our windshield wipers began to ice up and became less and less effective, leaving just a little window of clear glass to see through. Making them go faster, to shake off some of the ice, worked a little, but the problem persisted and then got worse. This was horrifying – as if the road conditions, the trucks, the vehicles off the road, driving with both hands in a death grip on the wheel, feeling that at any moment I could make a mistake and end up hitting another vehicle or running off the road and getting stuck, were not bad enough – now I could not see out of my own windshield. The only thing I could do was to stop the vehicle and get the ice off the windshield wipers by hand – but how to stop under these conditions, and how to get going again? We soon decided that there was nothing to do but let the cars following us get around us and then stop to clean the wipers, so I waited for the highway to go downhill and then pulled gently to the right, with my right blinker on, hoping the several vehicles behind me would pass. At first, the car behind me slowed with me and didn’t appear to be passing, but finally it got the idea and he and the cars behind him did pass. Then putting my hazard lights on and seeing that there was no one behind us, we stopped right in the lane and Bobbie and I jumped out, grabbed our respective wipers and slammed them against the windshield to get the ice off, and then madly picked the remaining ice off by hand. We did get going again since we were on an slope but with no one to follow and clouds of snow coming down, we found it very difficult to get our bearings and follow the tracks on the highway. It had been so much easier to follow someone. I don’t remember how quickly we caught up to another driver – I seem to remember someone in a four wheel drive vehicle, maybe a Yukon or Explorer, and us speeding up to follow them. However, during the next hour the exact same thing happened to the windshield wipers and we had to find another slope, check behind us to see that there were no cars, and then stop again dead in middle of the highway, to perform the same surgery to the ice on the wipers. After doing this a second time, we barely got going when traffic approached behind us and I was shocked to see everyone pass me on the right. Then my wife shrieked that I was driving off the left shoulder into the median. Frankly I just couldn’t see where I was, had entirely lost my sense of direction in the blinding whiteness and had almost indeed drove us off into the median where we would have stayed the night. Finally, we seemed to be back in the right lane where we belonged and moved ahead to follow the last of the vehicles that had passed us. Now somewhere east of Grants, the snow seemed to get better, that is, less coming down and less on the road. However, this was deceptive for later the snow and the accumulations increased again to dangerous levels, and to make matters worse, the snowflakes began to get larger, making visibility a problem as our headlights illuminated an opaque curtain of snowflakes coming toward us. At this time, heading down one of the long gentle slopes on I-40 we saw a nightmare situation for the westbound vehicles that were heading uphill. First there were trucks in both lanes going nowhere, probably spinning drive wheels and not moving. And behind them, as far as we could see, long lines of headlights of stationary vehicles, likely stationary for the entire night since it was highly improbable that the trucks could get going anytime soon with the snow coming down as it was. Another horrible distraction among the vehicles heading east with us were the foolish drivers who drove through the snow with their hazard lights on. To have your taillights blinking off and on was not helpful to anyone – certainly not the traffic following. We unfortunately came up behind such a vehicle and were so distracted and upset by the constantly blinking lights that we simply had to pass since we could no longer follow this vehicle and maintain our sanity. Finally we came up behind a panel truck that seemed to be going just the right speed with just the right amount of skill and initiative. 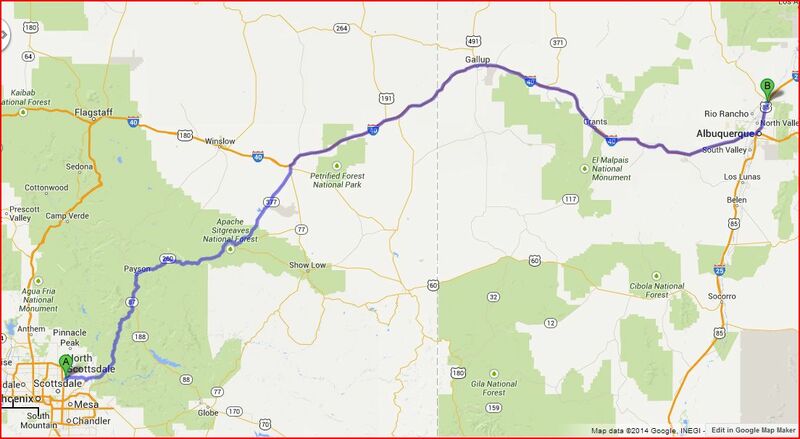 We were now approaching the To’hajiili exit, 40 miles west of Albuquerque, where Bobbie’s school is located and it seemed to us that, thank God, we were just about home. Although close to home and the end of this dreadful trip, the snow continued right on into Albuquerque, though, thank God, in lesser quantity so that we could keep our speed up to around 50 miles per hour. It was close to one of the first exits in the Albuquerque area that I passed the steady and reliable panel truck that had led us on the last fifty miles or so of the trip, and, looking at the driver, we saw that it was woman, undoubtedly a very skilled and resolute woman, for her vehicle did not appear to be a four wheel drive vehicle. I silently thanked her for her skill and leadership – it was a great experience following her. We finally reached the big Albuquerque junction of I-40 and I-25 and took the latter north toward Bernalillo. The first ten miles or so of I-25 were snowy but tolerable and as we approached Bernalillo, the highway finally cleared. There was no snow as we drove through town to highway 528 to our home. The driveway was clear and it was 11:00 PM. This normally six plus hour trip had taken twelve stressful and agonizing hours. I never appreciated a celebratory scotch on the rocks more in my life and was so thankful we had survived this terrible experience. Our son’s flight was late, so we were in plenty of time and later drove into the Albuquerque airport to pick him up at 1:00 AM. We had not seen an operating snow plow during the entire twelve hour trip.